IHG Rewards Club has a new rate promotion for 5,000 bonus points for stays of three nights or longer by the end of December at Staybridge or Candlewood Suites hotels. This promotion requires you to book specific “5000 Extended Stay Bonus Points” rate to be eligible for the bonus points. Here’s rate example for Friday to Monday weekend stay in November. The lowest rate is $117.99 night and the rate that is eligible for the bonus points is $174.99. Over the three night weekend, you would pay $171 not including taxes to get 5,000 bonus points that you cold purchase from IHG Rewards Club for $35. 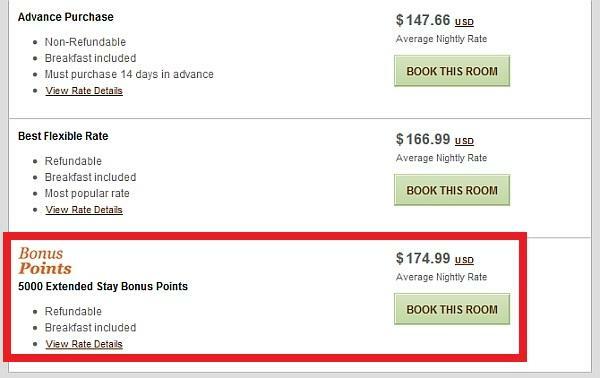 These IHG Rewards Club bonus points promotions that are tied to specific rate plan rarely, if ever, make any financial sense. In the above case, you would pay $171 + tax for 5,000 bonus points. This promotion may make sense if only rack rate is available. Seems that this offer rate is $5 higher than the best flexible rate.